Mission Statement Our Montessori school challenges each child to achieve excellence through an individualized program, which includes a schoolwide musical strings program. We inspire a passion for learning, instill a sense of personal responsibility, and cultivate a respect for the environment and involvement in the community. 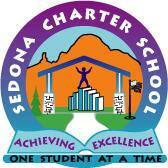 Services and Projects Founded in 1995, Sedona Charter School is the oldest charter school in Arizona. The Montessori method forms the foundation of the Sedona Charter School curriculum. Our children are taught by an intensely focused teaching team in multi-age, multi-grade classrooms. The campus houses 160 students and within this small school atmosphere, the children reach high levels of academic achievement, take care of several gardens, interact with the community and learn the importance of making a difference. Lower Elementary, Upper Elementary & Middle School multi-aged classrooms, housed in 3 buildings around campus, along with garden beds & a pond, create a hands-on learning environment for every student. Established in 1992, Sedona Charter School is a Montessori based learning environment for children in 1st - 8th grade. A tile mural of the Sedona Charter School logo made by former students. We have an urgent need for funding for ORCHESTRA SEATING. We need 50 orchestra chairs and storage carts to hold them, which will cost $5000. Please help by donating what you can to our Sedona Charter School Performing Arts Classroom fund! We are a 501c3 non-profit. Thank you! Change the world by helping Sedona Charter School to deliver on its mission and vision! We are seeking 2 new board members. We are particularly seeking people with non-profit or educational business management expertise who can help on our strategic planning and achieving excellence committees. Time commitment is one or two meetings per month. With prep time, this is about 6 hours per month. Please visit our website to learn more about us: www.sedonacharterschoool.com. We need to move our playground to make room for our new music building. Can you help provide funding or expertise? Our musical strings program is growing! We now have more than 100 students in grades 1 through 8 participating in our strings program, ranging from beginner to advanced orchestra. Many of these students could not participate if they had to rent or buy their own instrument, so we loan them school instruments to use. But we have run out of instruments! Please help us by donating instruments or money to help pay for 1 new viola ($450), and 1 bass ($1500). Keep youth music growing in Sedona! 12:00pm and 1:00 to 2:00 or 2:30pm. Volunteers are needed to listen to readers, help with problem solving or to guide little hands as they learn to crochet, knit or needlepoint. Thank you to Astara for bringing a vacuum cleaner to the school for one of the classrooms. We appreciate it very much! We have two other classrooms that could use the same. All the high traffic on the carpeting keep those vacuum cleaners busy! We have found a volunteer to help our first through third graders learn to crochet!! Thank you Stephanie! There are many children who want to learn this craft and one to one attention works wonderfully. We are still seeking volunteers who are interested in coming in to the Sedona Charter School to work with the children learning to crochet. Thank you so much! Calling all Crochet Artists! Our 1st through 3rd grade students want to learn how to crochet. Volunteers are needed to work with students 1 on 1. We provide the yarn and needles. If you are willing to spend time teaching our students to crochet, please contact the school office @ 204-6464.